It was just an ordinary day in my secondary school; the history teacher had promised us a surprise presentation about one of the topics within the Curriculum “Michelangelo & Sistine chapel” to be given by an expert of Italian Renaissance. The mood was upbeat; all the girls looked happy but sadly it was short lived. Once he started the slide show, you could hear many sighs of disapproval & muttering that got louder. Within few minutes, one of the girls stood up & started shouting, “This Anglo will go to hell” and stormed out off the room. 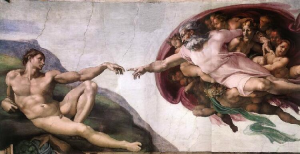 Apparently The iconic image of the hand of God giving life to Adam was too offensive. “How dare him” she said. The presentation continued but was fast tracked. I still vividly remember our heated conversation after. It went as follows (for Abbreviation I will put her name as Y & mine as N). N: So what exactly did you not like? N: but this was a history lesson & has nothing to do with religion does it? N: That is certainly not my intention and you still haven’t answered my question. Y: Religion guides us on every thing including History. We shouldn’t learn un- Islamic topics. This argument was my first introduction to a commonly heard word “Haram” (forbidden) and it became a recurring theme, which has never stopped ever since. A long, endless list from Art and music to TV & Cinema, even nail varnish, as far as the radicals are concerned, they are all haram. Radical Islamic groups are exceptionally good at expressing what they do not like, they keep yelling time after time to reinforce their message. However, when you ask them what they stand for, you only get evasive answers deliberately lacking in clarity, they never engage in a dialogue; they only argue and lecture in extremely self-righteous indignation. Reading Islamic history convinced me that my colleagues interpretation of Islam is not necessarily correct, and there is another side of the story. A true civilisation can not survive while rejecting art & music, may be it creates its own version, but a total rejection seems absurd. However, books were not enough ; I wanted a more reliable evidence, and indeed I got it many years after from an unexpected destination, the Islamic Republic of Iran, to be precise in Esfahan! The Persian describe Esfahan as” Nesf-e-jahan” (half the world) and at least in my case. Esfahan is full of hidden treasures; one of them is the beautiful palace Chehel Sotun Museum, a feast to the eye with its magnificent, intricate fresco. Also, inside there is a precious mosaic described by many as” the one that survived the Islamic revolution”. My apology for my photographic skill which doesn’t reflect the true beauty of this rare piece. This semi naked woman with a man kissing her feet surrounded with a mixed group of men and women playing various musical instruments reflect a different side of Islamic culture, vibrant, colourful and diverse. Some may argue that this might be a decedent era in Islamic history. Certainly not, the palace was built during the era of Shah Abbas, one of the greatest rulers of the Safavid dynasty. Looking at the religious side, Iran also provides different Islamic perspective. The majority of Iranians are Shiites Muslims, and they have an entirely different attitude to art. 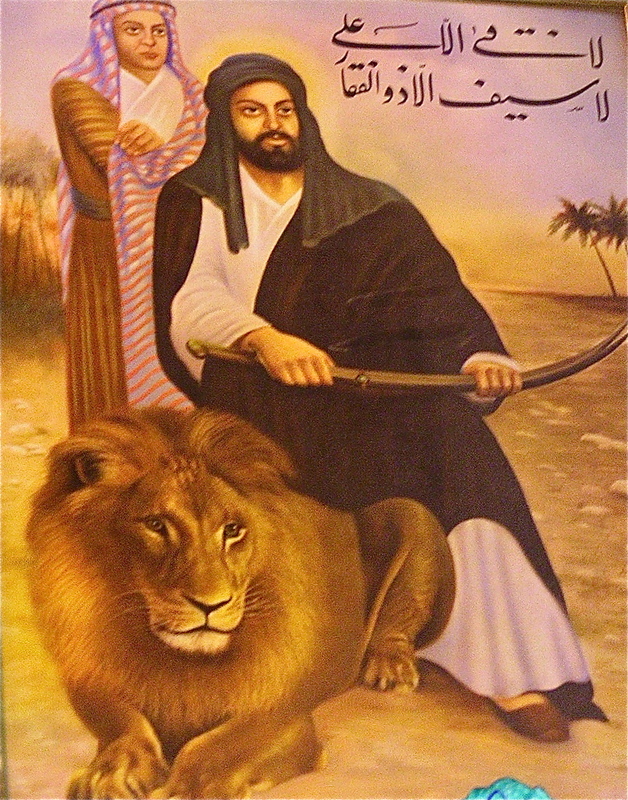 They are more than happy to portray images of Imam Ali and his family, though they admit that these images may not be a true reflection of him, but they are still happy to use them. Islam is not a monolithic religion; there are different cultures within various Muslim communities and certainly different interpretations of the Quranic verses. Sadly some groups are trying to impose their own interpretations as the true and only one, they see the world from a dogmatic prism (halal or haram). They forget that God didn’t create the world in black and white, but in a vibrant, different colours with diversity as the basic rule of nature. These groups are not just a modern phenomenon, but they existed throughout the Middle Eastern history. Perhaps this explain why the History of the Middle East is not linear but goes in circles, a progressive era of enlightenment and prosperity followed by a regressive period of intolerance and stagnation. Back to Signor Michelangelo; though I missed my first chance to see the impressive collection properly, life was kind to me, (which is not usually the case) and I had a second chance two years ago to see the Sistine Chapel, during a visit to Rome and enjoy this beautiful place. Inside the Chapel, I had mixed emotions, delighted to see it on one hand, but also sad that some couldn’t appreciate it even from a pure artistic prospective. Michelangelo did his monumental work within the spirit of his time and religion, and no one has the right to judge him or his work. As for the Almighty, he certainly had 470 years to express his dissatisfaction, if any. This entry was posted in Uncategorized and tagged Religion. islam. Michelangelo . sistine Chapel. middle East. radical islam. Bookmark the permalink. – The school story about Michael Angelo, and your exchange with Y, is telling: there is Y who is narrow-minded (I am sure she was a victim to some sort of home indoctrination), who will not think for herself and is destined to stay, if not reformed, close-minded for the rest of her life, and lose out when it comes to enjoying the beautiful arts and literature produced by Mankind; and then there is N who is independent in thinking, and uses her brains rather than follow cultural norms, and is destined to be a well-rounded human-being who will reap the benefits of being open-minded by enjoying all cultures and civilisations. The first is a loser; the second is a winner. – I am glad that you found within your civilisation marvellous samples of beauty. Islamic civilisation represents the totality of the Muslim people, and throughout the last fourteen centuries, open-minded Muslims have contributed to the world civilisation and produced brilliant arts and literature: in Iran, India, Turkey, Egypt and Spain. – I like this sentence: “As for the Almighty, he certainly had 470 years to express his dissatisfaction, if any”. A brilliant one, but likely to cause N some trouble – possible ‘takfeer’ from Y! A great example of how complex the issues are when we start talking about anything that may have a religious root. I see things from my ‘Christian’ or ‘Atheist’ point of view where I can express my opinion and question things in order to track down the true faith if there is such thing. I will never be able to discover it if I am not allowed to query/question things and the way things they are! I can not guarantee that my views are the correct one but I will fight for my right to express my opinion and I don’t think that ‘god’ is so vindictive because I may have disagreed or have broken a faith rule. Isn’t that the point in so many instances? When one’s view is so narrow, it is difficult to have a perspective of any kind, on any thing. One is blinded by bigotry and hatred, and/or prejudice and intolerance. This is a wonderful example and great reflection, once again drawing upon your experiences, very insightful! My first reaction to your piece was that with a few name changes it could have been written about Christian and Jewish fundamentalism, both as they exist at the present moment and at various times in the past… also, sadly, Hindu and Buddhist fundamentalism displays much the same rigidity and intolerance. This is important to take into account. As you pointed out, the range of the different expressions of Islam, both historically and geographically, is enormous, and this also can be said about the other major religions… and fundamentalism, as a social and cultural phenomenon, also displays a corresponding range of expressions. It is also necessary to point out that non- religious rationalist philosophy has produced its own versions of fundamentalism..I’m thinking especially of pseudo-Marxist ideologies such as Stalinism and Maoism, both of which are responsible for millions upon millions of deaths and long years of repression and fundamentalist stagnation and rigidity. Which makes me think that it is a ubiquitous trait of the human mind, expressing itself in ever-evolving new forms as history unfolds. Indeed, it is all too easy to see its seeds in the processes and productions of one’s own mind, if one can gain the objectivity from one’s own prejudices to arrive at an objective view. Many religions and philosophies throughout history have attempted to discover and systematise methods where-by you can do just that… which only goes to prove that when human beings create problems for themselves they immediately set to work to find a solution.. one of the paradoxes of human behaviour! So you saw his work many times? I thought one is bad enough- if indeed his work is wrong- How you would justify that in front of God? to build a cultural bridge, which may closes each others more. I noticed that you talk much about a different culture which you don’t really know. So which culture I don’t know? My native Arabic- Islamic culture which I born or the western culture where I currently live, and what exactly I don’t know ?